Tapulanga Foundation blog: Eat. Share. Love. 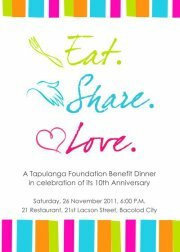 A Tapulanga Foundation Benefit Dinner in Bacolod.